Three cats are sitting on a tree branch. Two are looking in one direction and one in the other direction. 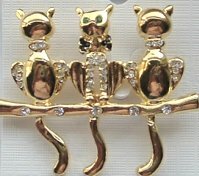 This goldtone pin is 2" wide x 1 3/4" high. There are rhinestones decorating the tree branch and the cats. The cat looking forward has a black rhinestone bow tie and green rhinestone eyes.